Key lime pie is made of Key lime juice, eggs, condensed milk, and sugar in a pre-baked pie shell. 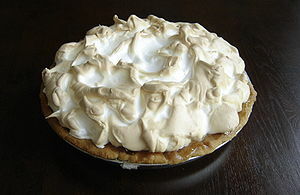 The pie is then baked, often with a meringue on its top. Other recipes (with slightly different ingredients) call for it to be chilled or frozen, using an unbaked Graham cracker crust. This makes it a popular summer dessert. The dish is named after the small Key limes (Citrus aurantifolia 'Swingle') that are naturalized throughout the Florida Keys. Their ferocious thorns make them less tractable and their thin yellowish rind makes them less shippable, but they are both tarter and more aromatic than the common Persian limes seen year-round in most U.S. grocery stores. Proper Key lime pie is made with canned sweetened condensed milk, since fresh milk was not a common commodity in the Florida Keys before modern refrigerated distribution methods. Key lime juice, unlike regular lime juice, is a pale yellow. As such, Key lime pies are also pale yellow. Green Key lime pies, such as the one in the opening scene of Natural Born Killers, are not authentic, and the green color is due to added food coloring. Many "Key lime" pies are made with standard Persian limes since they tend to be larger and yield more juice, thus making them easier to work with. During mixing, a reaction between the condensed milk and the acidic lime juice occurs which causes the filling to thicken on its own without requiring baking. Many early recipes for key lime pie did not instruct the cook to bake the pie, relying on this chemical reaction to produce the proper consistency of the filling. Today, in the interest of safety due to consumption of raw eggs, pies of this nature are usually baked for a short time. The baking also thickens the texture more than the reaction alone. Small mixing bowl, spatula, stand mixer. Separate egg whites from egg yolks. Make sure there is no trace of yolk in the whites! Begin by beating the sweetened condensed milk, lime juice and egg yolks in a small mixer bowl. Pour the mixture into the baked pie shell. Bake at 350°F (180°C) for 8 minutes. While baking filling, beat eggs whites in a large, clean mixer bowl on high speed until soft peaks form, then add sugar gradually until meringue forms hard peaks. Spoon the meringue over the top of the hot pie and use a spoon to form peaks. Bake at 350°F (180°C) for 10-15 minutes, or until meringue begins to brown.